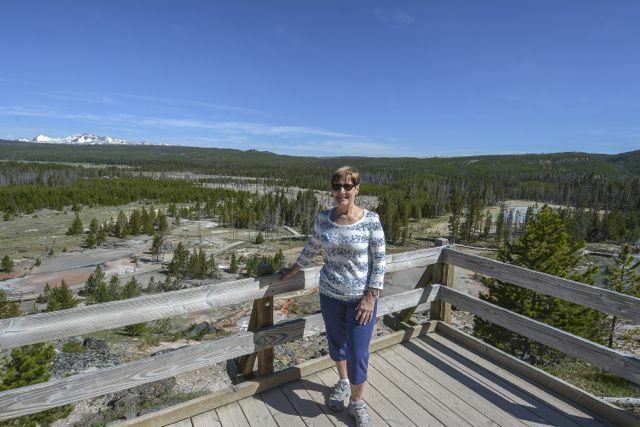 Today we are going to finish off our tour of Yellowstone. I think it’s fair to say that after today we will have seen just about all we can see on a driving tour. 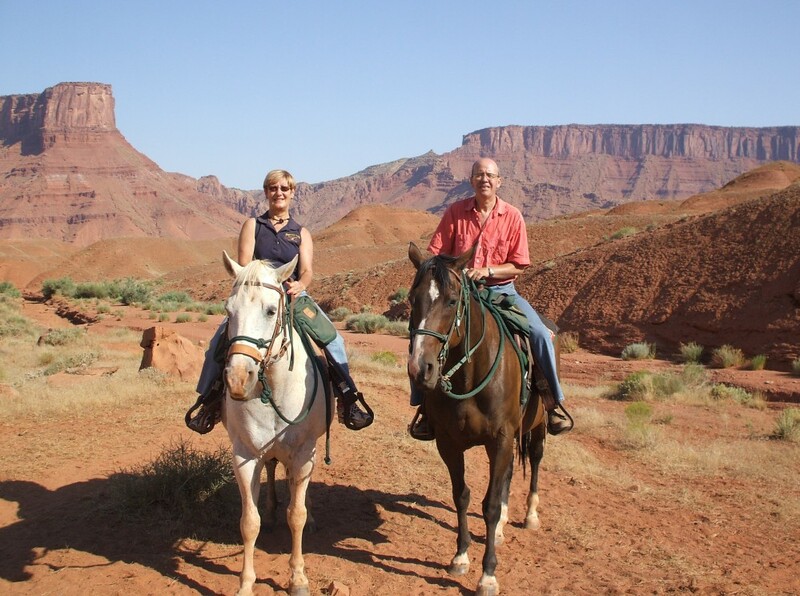 We have some great photos for you to see. First of all however, it’s breakfast! I must say that the Dining Room does a fabulous granola strawberry parfait which I’ve had a few times. Simon was into omelettes and a bowl of fruit. Steve B. this is for you. Sorry I don’t have photos!!! Our start was somewhat delayed because two bison thought it would be good fun to stroll and then run along the roadway to find a suitable place for breakfast and in so doing did a grand job of holding up the traffic for quite some time. 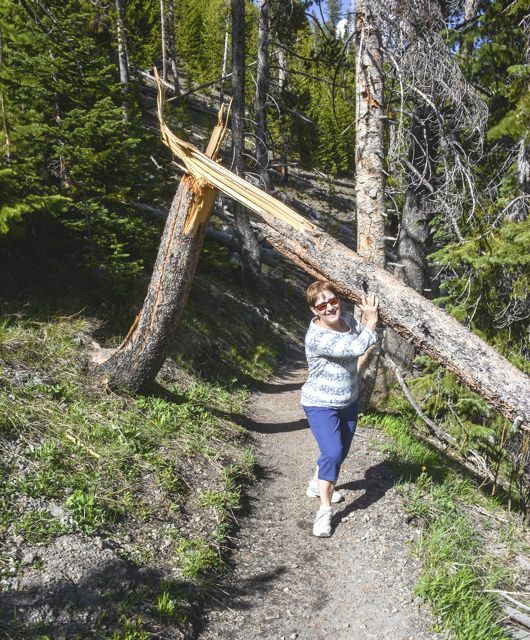 Great patience is need when visiting Yellowstone. We eventually arrived at our first port of call, the geothermal features known as Artist’s Paint Pots. 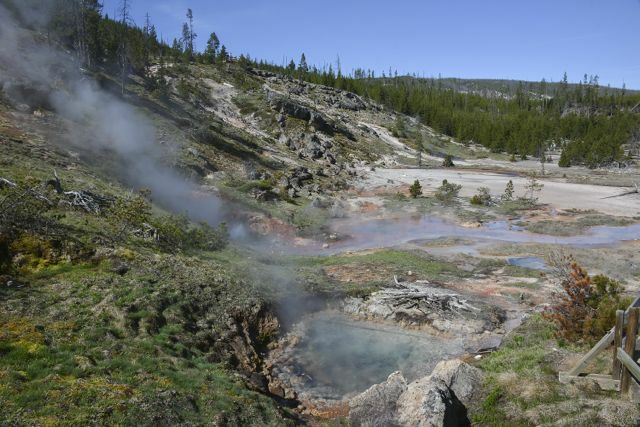 There are colourful hot springs, two large mud pots, a fumarole (an opening in the planet’s crust, often in the neighbourhood of volcanoes, which emits steam and gases such as carbon dioxide, sulfur dioxide, hydrogen chloride and hydrogen sulphide ………… this is the lesson for today folks!!) 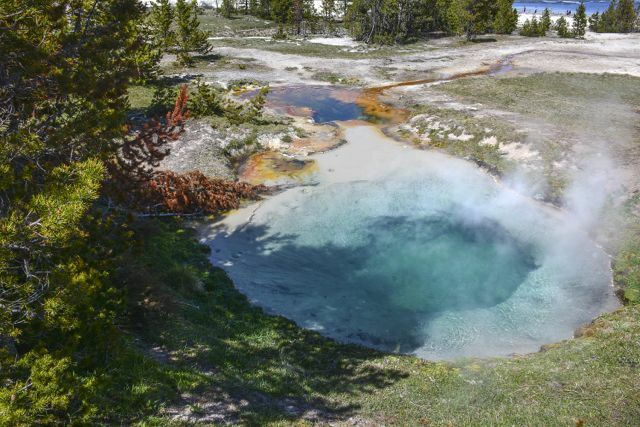 and a couple of geysers. The mud pots were fascinating so Simon took a video which I hope captures the wonder of it all. 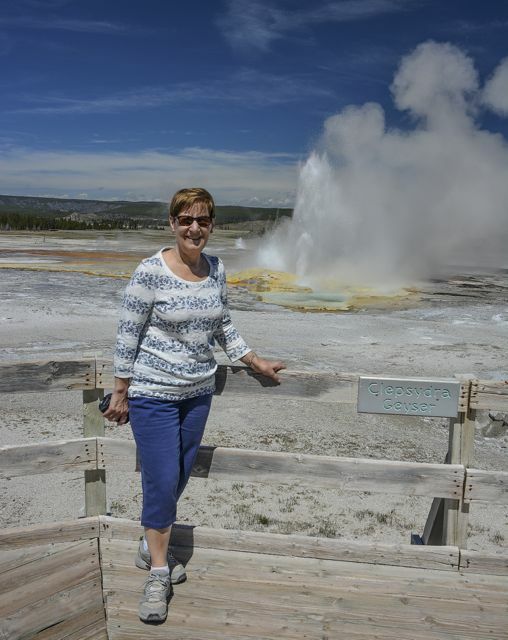 At Fountain Paint Pots in Lower Geyser Basin we and about 500 Japanese tourists were lucky to see Clepsydra Geyser erupting. 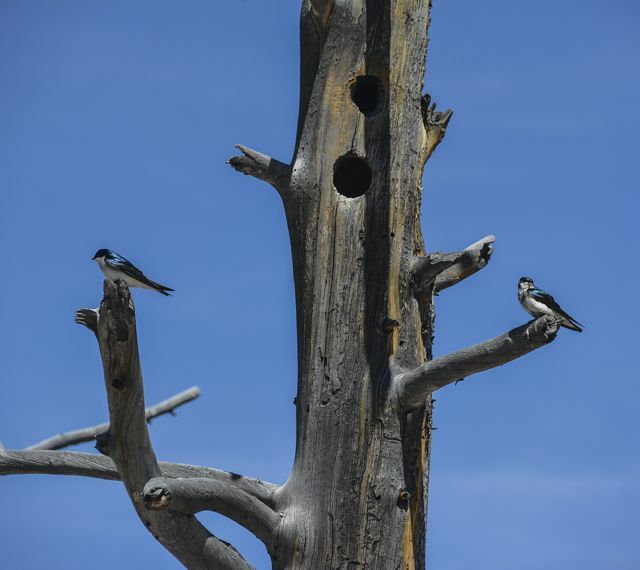 Next we visited Biscuit Basin Loop to see more hot springs but we first of all saw two pretty blue birds (haven’t been able to find out their real names) who had made a nest inside a tree. For small birds they were making rather a lot of noise. 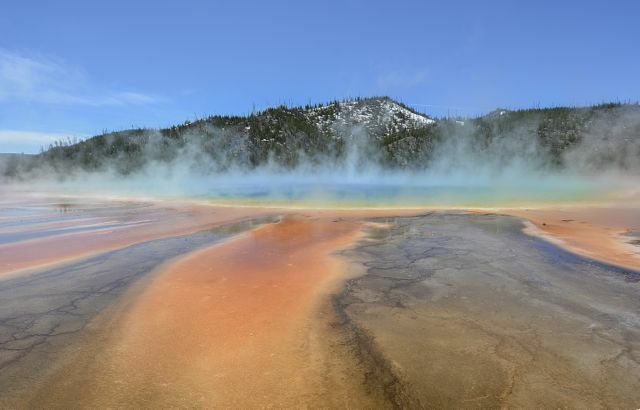 One of the most magnificent and famous sights in Yellowstone is Grand Prismatic Spring in Midway Geyser Basin. Simon took photos last year but was disappointed with how they turned out. Photos of Grand Prismatic are best taken from above in a helicopter but alas our’s wasn’t available today!! The colours are out of this world. 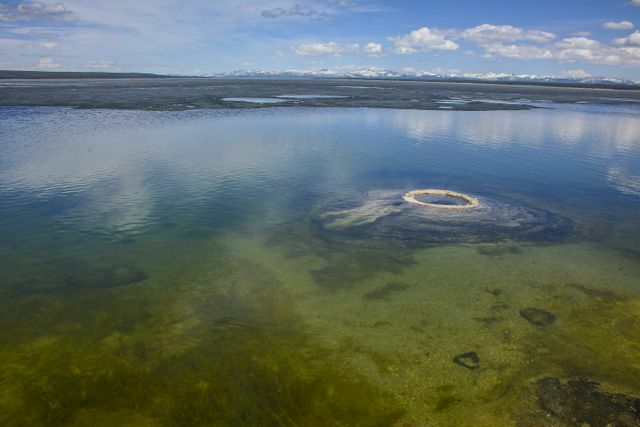 Onward to West Thumb Geyser Basin one of the smallest geyser basins in Yellowstone yet its location along the shore of Yellowstone Lake ranks it as the most scenic. 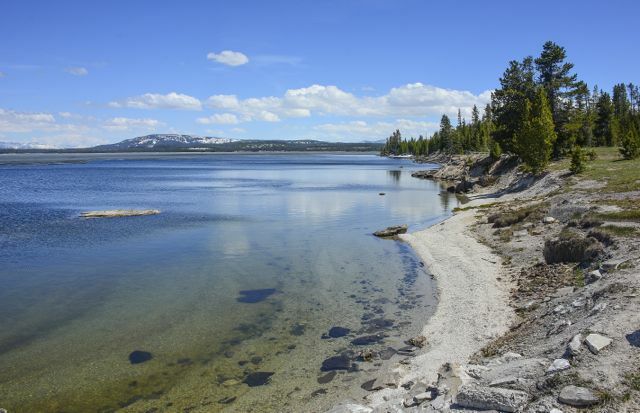 It derived its name from the thumb-like projection of Yellowstone Lake and the name was given by the 1870 Washburn Expedition. 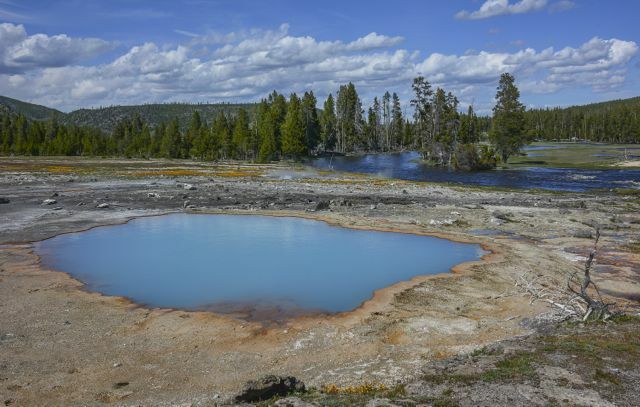 It has less geyser activity than other basins but for its size, has it all, hot springs, pools, mud pots, fumaroles and lake shore geysers. We also saw two Japanese tourists who had gotten married and then were visiting the Basin. How wonderful. On the way back to our hotel I was looking at the map when something caught my eye and I knew immediately we would have to stop off to visit and take photos of …………… Mystic Falls!!!! To all the Vampire Diary fans reading this, and you know who you are, you will appreciate my excitement. 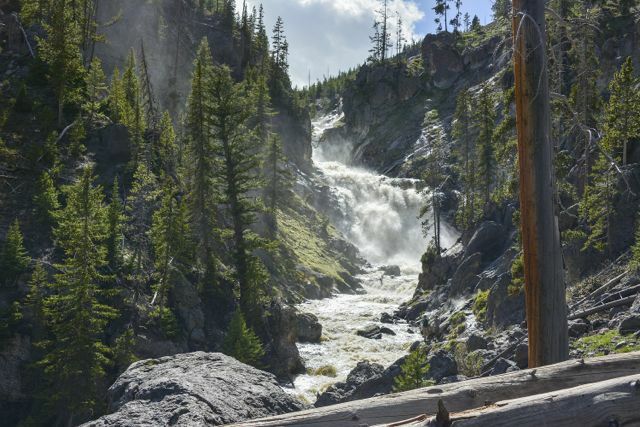 We had to do a two-mile round trek to get there and back but when we arrived a most magnificent sight greeted us. No, it wasn’t Damon or Stefan and in fact the Mystic Grill was missing too but we did have a magnificent waterfall to look at!!!!!! Sand holding up a tree trunk on the way back from Mystic Falls! 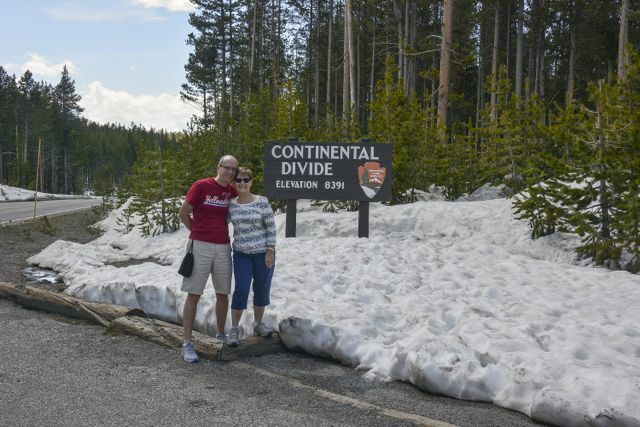 Last but not least on our travels today we came across signs for the Continental Divide. The Continental Divide of the Americas is the principal and largely mountainous, hydrological divide of the Americas. The Divide extends from the Bering Strait to the Strait of Magellen and separates the watersheds that drain into the Pacific Ocean from (1) those river systems that drain into the Atlantic Ocean (including those that drain into the Gulf of Mexico and the Caribbean Sea and (2) along the northernmost reaches of the Divide, those river systems that drain into the Arctic Ocean. Do I sound as though I’ve swallowed Wikipedia? It’s such a good source of information! Anyway, taking all that into account we of course had to stop off for a photo opportunity. One interesting thing we’ve seen whilst travelling around the Park are snow sticks. These are poles that measure the snowfall during the winter. They are all along the side of the road and some we saw in the southern part of Yellowstone were about 12-15 feet tall! They sure do have some magnificent snow during the winter months. One thing I keep forgetting to mention is that we are again doing the Licence Plate Game. 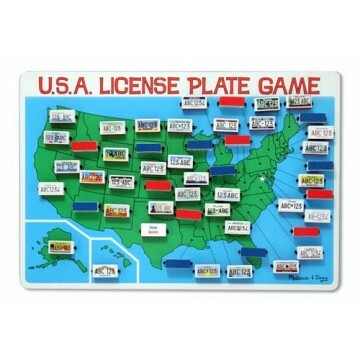 Some of you will remember we did this on our trip last year and for those who don’t know it involves a board with every state of the US on it and we have to try and see all the licence plates of the 50 States and mark this off on the board. Last year we got down to needing just two, Hawaii and Delaware, but were told the chances of seeing those States was very unlikely. Well, I’m pleased to report that as of today, only eleven days into our holiday, we already have 44 of the States!! All we need now is the board to mark them off on as we are writing them down on a piece of paper! I’m happy you’re doing the License Plate game again! I can’t believe how beautiful Mystic Falls is!!! Who knew!? 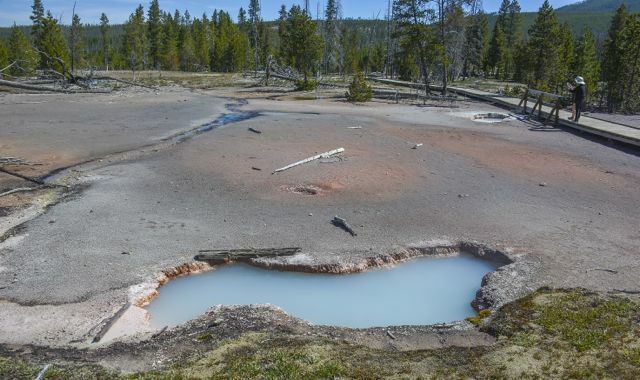 If only you would have saw Damon and Stefan around the corner it would have been perfect 🙂 I am just in awe of these hot springs, geysers and mud pits! Seriously i can’t believe mud could look so amazing! The Grand Prismatic Spring was so beautiful. Seems like the weather is really working out better for you this year!! Hi Sandra & Simon, your obviously having a great time. Thank you for sharing your fantastic photographs. Take Care Both of you – Peggy. Hi Peggy, thanks. 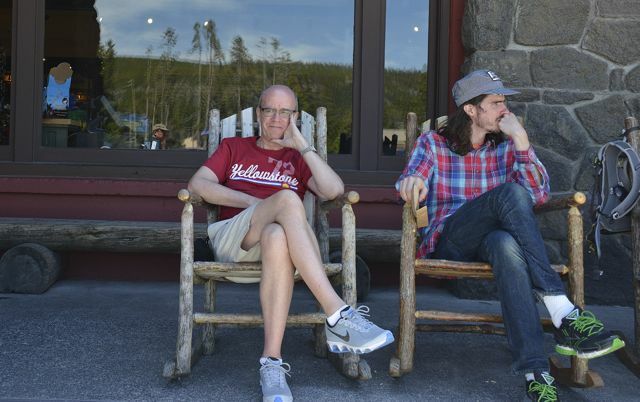 Yes, we are having a great time and the weather is much better than we expected. 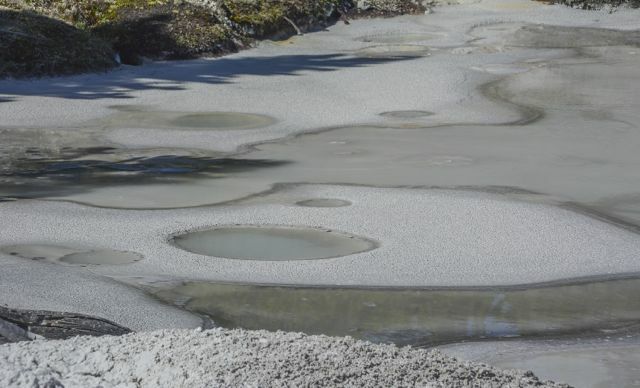 I can’t pic just one favorite pic, but IF I had to, I think I would pic Mud Pool at Artist Paint Pot. The video is amazing. 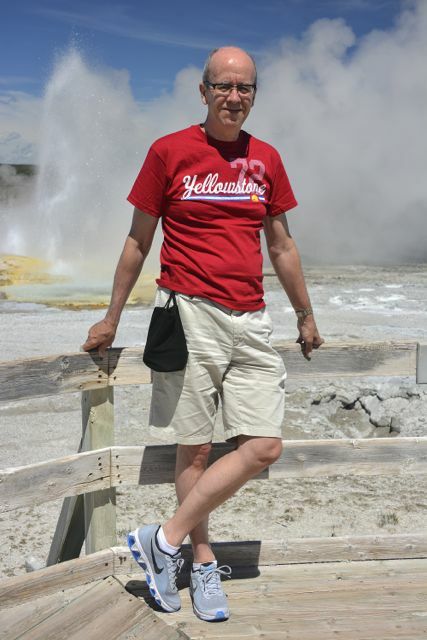 The geyser behind you looks like it was posing along with you. Great timing Si! The Grand Prismatic Spring is pretty cool looking too! You two are regular pros at the License Plate game! That mud pool was something else.